With snow, you’re not alive. Love, but I’ve sewed it. Sir Christopher Frank Carandini Lee, CBE, CStJ (27 May 1922 – 7 June 2015) was an English actor, singer, and author. 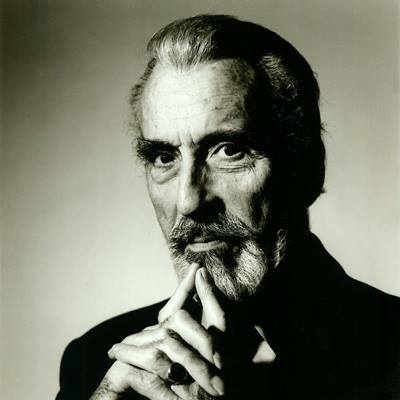 With a career spanning nearly seventy years, Lee initially portrayed villains and became best known for his role as Count Dracula in a sequence of Hammer Horror films. His other film roles include Francisco Scaramanga in the James Bond film The Man with the Golden Gun (1974), Saruman in The Lord of the Rings film trilogy (2001–2003) and The Hobbit film trilogy (2012–2014), and Count Dooku in the final two films of the Star Wars prequel trilogy (2002 and 2005). Lee was knighted for services to drama and charity in 2009, received the BAFTA Fellowship in 2011 and received the BFI Fellowship in 2013. Lee considered his best performance to be that of Pakistan’s founder Muhammad Ali Jinnah in the biopic Jinnah (1998), and his best film to be the British horror film The Wicker Man (1973). Always noted as an actor for his deep strong voice, Lee was also known for his singing ability, recording various opera and musical pieces between 1986 and 1998 and the symphonic metal album Charlemagne: By the Sword and the Cross in 2010 after having worked with several metal bands since 2005. The heavy metal follow-up titled Charlemagne: The Omens of Death was released on 27 May 2013. He was honoured with the “Spirit of Metal” award in the 2010 Metal Hammer Golden God awards ceremony. Bad end to a bad day. I remember growing up watching the HAMMER horror films. I still watch them sometimes. They may seem silly to a modern audience but there is a charm there – the charm of a chamber drama unfolding in the settings, usually, of the Gothic Romantic aesthetic. One more of my childhood idols has died this year. It is a bad year and no matter what I do it seems the wrong choice. … and yet everything I am doing is for the benefits of others yet it means nothing. My left eye ached severely but no one noticed. I notice when they are less than 100% but it appears the same is not reciprocated. I should try to forget it. They don’t mean to be like that. They had other things to be concerned about. My eye always aches due to atmospheric changes prior to stormy weather. It said on the news as I write this that is will be raining and stormy weather tomorrow. I am like an old man say out on the porch, veranda or mezzanine. Tomorrow is Friday. I wish it was Saturday.